KUALA LUMPUR, AUG 6: Reveal the truth behind the Malaysia Airlines MH370 tragedy as soon as possible, DAP Socialist Youth (DAPSY) today urged the government. 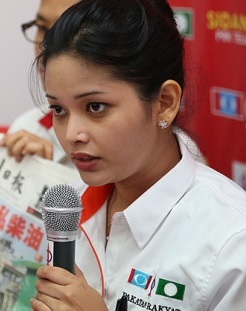 National executive member Dyana Sofya in a press statement urged the authorities to continue to find answers to the March 2014 incident, when the Beijing-bound MH370 disappeared. “We hope that this is not just a closure but also providing more clues in solving the tragic mystery of the unfortunate MH370 and the effort should not just stop here. The authorities must continue to find answers about what exactly happened on that unfateful day,” said Dyana. Dyana was referring to the recent discovery of plane debris on Réunion island, a find that was later confirmed by French authorities, Bureau d’Enquetes et d’Analyses pour la securité de l’Aviation Civile (BEA), The Malaysian Investigation Team, Technical Representative from PRC, and Australian Transportation Safety Bureau (ATSB) to be a wing part from the ill-fated MH370. MH370 began its last flight on 8 March 2014 with 239 passengers on board. It was scheduled to depart from Kuala Lumpur International Airport (KLIA) to Beijing Capital International Airport but it went missing and lost its voice contact shortly after its departure. A multi-national search effort then ensued with a vast search scope covering both South China Sea and Indian Ocean, but to varying success. Dyana also extended her condolences to family members and relatives affected by the MH370 tragedy, saying that the unfortunate incident will always be “in our hearts”. “All of our hearts, thoughts and prayers go to the passengers and crew, their family members and friends and to all Malaysians who are definitely affected from this news,” added Dyana. This article was written by admin on Thursday, August 6, 2015 at 3:15 pm. You can follow any responses to this entry through the RSS feed. You can leave a response, or trackback from your own site.